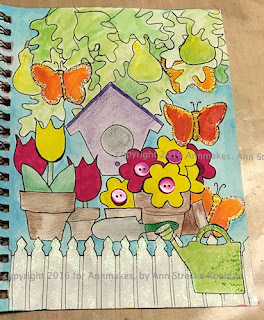 Here is how you can make your very own colouring pages! Caught the adult colouring craze? Want to make some unique pages to color? Well, today is your lucky day. Check out this video I made (Click on the title above or Link below) over on my youtube channel on just how easy it is to make some colouring pages of your very own. Yes, even if you don't think you can draw. All you need is some paper, a pencil, a permanent ink pen, an eraser, and a stencil or two. This is a good way to find another use for those scrapbooking stencils you still have somewhere in your stash. I know some of you have those, as I have some myself. It's easy and fun. While you are over at Youtube please subscribe to my channel and use the hashtag #LoveSpringArt to see MORE Spring themed inspired creative content videos. *The Tombow products I used and mention in the video were purchased by me prior to becoming an Ambassador for Tombow. If you would like to purchase similar products you can do so by checking out the www.Tombowusa.com site.